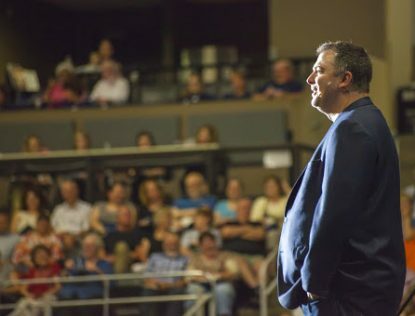 Acclaimed Catholic speaker and author Matthew Kelly will speak at two churches in the Philadelphia Archdiocese on June 28 and 29, along with singer-songwriter Eliot Morris. Spring is a wonderful time to recharge one’s spiritual batteries. Around the Archdiocese of Philadelphia there will be a number of programs that can assist in doing just that, according to Meghan Cokeley, director of the archdiocesan Office for the New Evangelization. Dr. Hunt is himself a perfect example of a dynamic Catholic. A convert to Catholicism, gifted speaker and former Methodist pastor of a megachurch, he brings all of the enthusiasm and conviction of a convert to his lectures. George Lower, an award-winning singer-songwriter, will add musical accompaniment. On Monday, April 8 at 7 p.m. Msgr. Michael Magee, chair of systematic theology at St. Charles Borromeo Seminary, will lecture on When Peter and Paul Disagree: Living in Faithfulness and Charity Amid Public Controversy to be held in Vianney Hall Auditorium at the seminary. As a coincidence, Msgr. Magee is also a convert from Methodism, in his case while a student at the University of Pennsylvania. In the cases of both Dr. Hunt and Msgr. Magee, they are definitely a gain and a blessing for Catholicism. Regina Angelorum Academy will have a Forward in the Faith benefit on Tuesday, April 9 at 7:30 p.m. featuring a keynote talk by Rwandan genocide survivor Immaculee Ilibagiza. She will tell her an incredible story of keeping the faith under extremely difficult conditions. The event will be held at the Llanerch Country Club, Havertown, and include an open bar cocktail hour, hors d’oeuvres and VIP reception — a bit more upscale than Rwanda. Bill Donaghy of the Theology of the Body Institute will be the emcee. See ReginaAngelorumAcademy.org for ticket details. The conference is for those who wish to find freedom for themselves or want to learn how to help others find freedom. Neal, Matt and Janet Lozano of Heart of the Father Ministries are the presenters. See the St. Mary Magdalen website for further information. The Be Not Afraid! Family Vocation Day will be held Saturday, June 15 at the National Shrine of Our Lady of Czestochowa in Doylestown to promote vocations in the church. Keynote speaker for the day will be Leah Darrow, a former America’s Top Model contestant who left the fashion industry after a conversion experience. Bishop Timothy Senior, rector of St. Charles Borromeo Seminary, the Pauline Fathers and members of several religious congregations will share their way of life in talks geared to children, teens and adults, and everyone who supports and prays for religious vocations. On June 15 from 6:30 a.m. to 2:15 p.m. at St. Agnes Church, Sellersville, prominent Catholic theologian Dr. Scott Hahn will give not one but three lectures on the topic, Given for You, Sacrifice of the Mass; How to Get the Most out of Mass and either Evangelizing Catholics or the Healing Power of Confession. No, Dr. Hahn is not a former Methodist; he was a Presbyterian minister before finding his way into Holy Mother Church. He is the father of six and grandfather of 18 with two sons studying for the priesthood for the Diocese of Steubenville. Relevant Radio will host its National ELEVATE Conference on June 22 all day long beginning at 9 a.m. at the National Shrine of Our Lady of Czestochowa in Doylestown. It is an opportunity to meet and pray alongside Relevant Radio show hosts Patrick Madrid, Drew Mariani, Father Richard Simon, Father Matthew Spencer, Msgr. Stuart Swetland and Sheila Liaugminas. See RelevantRadio.com for further details. St. Helena Parish in Blue Bell will host the program Living Every Day with Passion and Purpose, 7-10 p.m. on Friday, June 28, featuring acclaimed Catholic speaker Matthew Kelly. Are you thriving or just surviving? Do you want more energy? A deeper sense of purpose? This may be the program for you. Kelly, who is originally from Australia, is the founder of the Catholic Church Institute and the author of “Rediscovering Catholicism,” with millions of copies sold worldwide. Accompanying Kelly will be singer-songwriter Eliot Morris. If you can’t make Living Every Day with Passion and Purpose at St. Helena, Matthew Kelly and Eliot Morris will have the same program the following evening, Saturday, June 29 also from 7-10 p.m., at St. Ephrem Parish, Bensalem. Organizers expect both nights to sell out early. See DynamicCatholic.com to order tickets for either venue.